It’s Week Three in the Texas Beef Council’s Healthy Meals to Fuel Your Family campaign! This week, we’re focusing on Healthy Family Favorites. These meals are the perfect to fill up your family. And when you make healthy choices, like using lean meat and nutrient-rich veggies, your family gets the benefits! And now, for this week’s yummy recipe! This was my favorite dish we sampled at the Appetite for Inspiration cooking event last year. Be warned: this recipe is SWEET. If you are not a fan of sweet foods for meals, steer clear! This time around, I loved the pot roast and gravy. 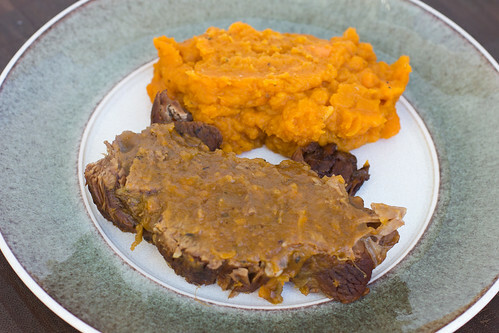 But I wasn’t really a fan of the mashed sweet potatoes… not sure what the difference was. It’s still worth a spot in your meal rotation, though! Plus, I LOVE that this is a one-pot meal. Fewer dishes to clean afterwards is a MAJOR PLUS in my book! Heat oil in stockpot over medium heat until hot. Place beef pot roast in stockpot; brown evenly on all sides. Remove roast; pour off drippings and season with 1 tsp salt and 1/2 tsp pepper. Add onion and thyme to stockpot; cook and stir 3-5 minutes or until onion is tender. Add broth and cider; increase heat to medium-high. Cook and stir 1 to 2 minutes or until browned bits attached to stockpot are dissolved. Return pot roast to stockpot; bring to a boil. Reduce heat; cover tightly and simmer 2-1/2 hours. 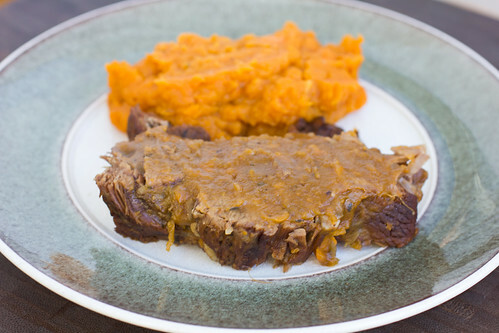 Add sweet potatoes and garlic to stockpot; continue simmering, covered 30 minutes or until sweet potatoes and pot roast are fork-tender. Remove pot roast; keep warm. Remove sweet potatoes and garlic with slotted spoon to large bowl, leaving cooking liquid in stockpot. Add maple syrup, ginger, 3/4 tsp. salt and 1/4 tsp. pepper to sweet potatoes. 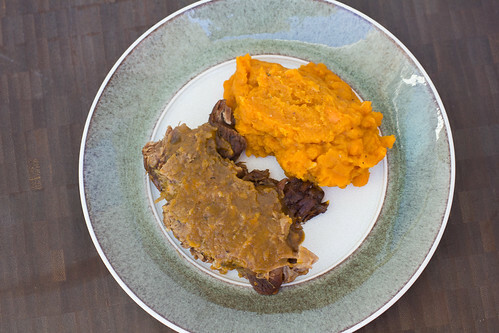 Beat until sweet potatoes and garlic are mashed and smooth; keep warm.